GlobalTrade.net officially launched this week with 5,600 plus listed International Trade Service Providers in its database. The new feature of the website complements its growing Knowledge Resource which currently consists of over 10,000 user-generated content items. 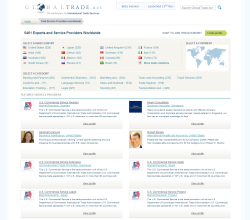 GlobalTrade.net officially launched this week with the release of its Database of International Trade Service Providers. The new addition to the website complements its growing Knowledge Resource which consists of over 9,000 user-generated content items. The new website was launched in partnership with FITA Online. The website launched with 10,000 expert-generated content items such as articles, videos, reports, events and whitepapers in its Knowledge Resource and boasts 5,400 listed international trade service providers in its Database of International Trade Service Providers. “Service providers working in international trade can list themselves in our database, freely promoting their services and gain visibility to exporters and importers searching for cost effective overseas counterparts to assist with their international operations,” Lehrer says. Experts and service providers are able to not only promote themselves in the database but gain more visibility on the worldwide web by publishing content where they can further share their knowledge, experience and tips in international business. In two weeks FITA Online plans to officially launch its Request for Offers service on GlobalTrade.net, where users can request quotes directly on the site to assist in their overseas business needs. GlobalTrade.net is run by FITA Online the online services division of the Federation of International Trade Associations (FITA), together with partners U.S. Commercial Service, UK Trade & Investment, ThomasNet, Alibaba and Kompass. GlobalTrade.net is a Knowledge Resource, where international trade professionals can find experts’ analysis, market surveys, tips, white papers, country profiles, experts’ views, webinars, news flows, video tutorials, etc. It is organised by “folders” about specific issues. It’s also an international Database of International Trade Service Providers where international trade professionals can select experts such as international marketing consultants, trade finance companies, banks, freight forwarders, quality control firms, lawyers, accountants, customs brokers, instructors, insurance providers for their international operations. FITA Online offers diverse online services to the worldwide international trade community. Its services include the websites globaltrade.net and fita.org, as well as International Trade Information Platforms for Banks, online international trade information systems for government economic development agencies and customized international trade marketplaces.